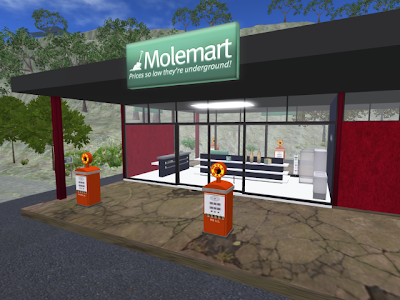 Mole Mart is your one-stop shop for all your travel needs when you are on the Linden Mainland roads. Drop in for free textures, landscaping goodies, vehicles, and more, all from the Linden Department of Public Works (the Moles). Seriously, lots of Linden locations have freebies. Keep your eyes open or grab the Landmarks at Mole Mart!